On 5th, the ECB (European Central Bank) had a council meeting and set the deposit facility interest rate to be negative. After the announcement, EUR/USD fell to 1.356, and as the press conference started, the rate became 1.3503, but the euro was bought afterwards and now it’s traded at around 1.366, which is higher than the rate before the meeting. The most significant decision in the meeting is the €400 billion TLTRO (Targeted Long-term Refinancing Operation), which will expand the monetary base by about 34%. 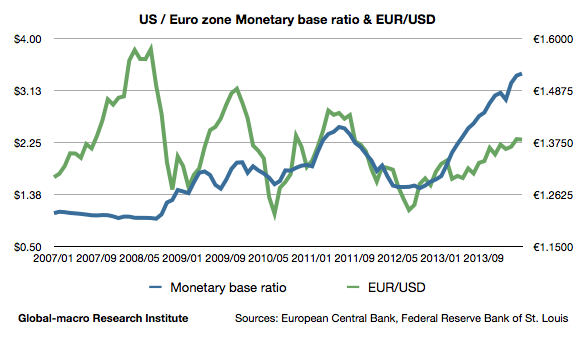 This is, again, the graph of EUR/USD and the monetary base ratio of the US to the euro zone. The TLTRO will decrease the monetary base ratio to around 2.53. This is the same range as in June and July, 2013, when EUR/USD was traded at 1.31. Considering the recovery of the US economy and the rising US interest rate, EUR/USD could fall below 1.3 eventually. Thus, the speculators who sold the euro after the conference were right in a long term, but others might have thought it’s too early. The TLTRO will be held in September and in December. In terms of fundamentals, EUR/USD should be moving in the range of 1.3-1.4, and in the end of this year, it will be likely to be below 1.3. It’s comfortable to trade when the currency moves like a bond, targeted to a certain price. We also need to note that this decision will delay quantitative easing. If Draghi wants to watch the consequences of the TLTRO before the QE, the QE will be at earliest in early 2015. This could be one of the reasons why the euro was bought after the meeting. On the other hand, the German long-term interest rate behaved in the opposite way; It rose at first, but eventually diminished, and now it’s traded lower than the rate before the meeting. The investors might have been disappointed without the QE, the bond purchase, but afterwards evaluated the size of the TLTRO. Yet, the German bond has been extremely appreciated. It could go up further, but the best buying opportunity is already gone. The European property companies have been straightforwardly appreciated. Gecina rose by 2.11%. Although we just reviewed the markets in a short-term basis, sooner or later they will be watching the actual effects of the negative interest rate and the TLTRO to the economy. At the moment, Europe is the most interesting market to watch and to trade in.